During the allergy season, you may find yourself addicted to your over-the-counter antihistamine medication and that can lead to many unwanted side effects. Let’s not even mention the possible long-term health risks with chronic use of these medications. The truth is that natural antihistamine supplements can work MUCH better for people who suffer from allergies. Natural and organic antihistamines can do the same job as the drugs, except they can provide many other health benefits and nutritional value without side effects. This is because they are real foods. What are the long term risks of taking OTC antihistamine drugs? The actual answer to this question is the same for a lot of medical risks: we really don’t know or have concrete proof for an answer. However, we have well-researched examinations of the side effects that can occur in up to 90% of people taking them. If you are in your thirties or forties, you’ll probably resonate with the common use of first-generation antihistamines: Benadryl, Claritin, etc. In this past decade, many parents were frightened to hear that conclusive research came out that links use of first generation antihistamines with the development of Alzheimer’s and central nervous system problems. I think that this information is very disturbing because a lot of parents during that time were giving these medications to their children daily. Since it took about 20 years for this conclusive research to come out, I am very skeptical about the safety of newer generations of antihistamines like cetirizine and levocetirizine. We are just talking about these new scientific journals about nervous system damage, which have been going on for quite some time. Plus, this was a concentrated effort that costed millions of dollars. Consumers of these drugs can also suspect that there are dependency risks involved with antihistamine medications. When you stop taking your OTC medication daily, you can experience withdrawal effects that can be very uncomfortable for a few days. Also consider your children having to go through this as well. Dealing with the acute symptoms of exposure to these drugs that we all recognize like drowsiness, insomnia, memory loss, dry sinuses and eyes, and more is always uncomfortable. Do Natural Antihistamine Supplements Actually Do Anything? Yes, these organic extracts and nutrients can actually be much more effective than drugs. They can do the same job as ALL of the other antihistamines: block the production of histamine and facilitate in the removal of it from your body. The general trend of antihistamine generations has been an increase in safety and duration of the medication. First generation antihistamines like diphenhydramine are going to be riskier and less effective than third generation drugs like fexofenadine (Allegra). If you feel like you need an OTC antihistamine during the day because your allergies are so bad, I would recommend that you take a newer generation drug like Allegra or Zyrtec. These look like they have the least risk right now and prove to be much more effective than older generations. If you’ve taken a “natural” allergy supplement before and it didn’t work for you, then this is probably because the actual antihistamine compound in the supplement was not high enough concentration for your allergy symptoms. Stinging nettle is a good example of this because its effects may be mild. Many old-fashioned natural allergy supplements include vitamin C or other vitamins claiming that they will help with allergies. The raw truth is that vitamin supplements will do nothing for your allergies because they haven’t been proven in research to do that. Vitamin C as an isolated supplement has actually not been proven to do ANYTHING to your body. So which natural and organic antihistamines actually work? There are a few things to consider when trying to get rid of your allergies. First, you must know that your diet and lifestyle dramatically affect the severity of your symptoms. If you do harmful things to your body like not sleep, overeat, drink alcohol, or do drugs for example, your symptoms are much more likely to be worse. When you are treating your allergy symptoms, you should see that as an opportunity to “mask” or lessen the severity of the symptoms for a few hours. Then, you should try to focus on your health to treat the foundation of your allergies: your immune system. This might take some time, but as your general health and immunity improve, your allergies can be treated at their root until they don’t bother you or even phase you. These natural antihistamines are safe for long-term use so that you can take your time with finding out what is beneficial for your unique health and immunity. Everybody is allergic to histamine. That is the whole point of it, so your body can produce its own inflammation. However, it can be really annoying and show up as symptoms. It’s now possible that you can take an enzyme supplement that will work to break down the histamine your immune system produces and the histamine absorbed from food. I was surprised at how much better it made me feel, regardless of whether or not I was experiencing allergies. The enzyme in particular is called diamine oxidase, or histaminase, the compound your body actually uses itself to eliminate histamine naturally. Diamine oxidase is a very new supplement and it really works for me and others who have histamine intolerance and allergies. It was really worth the value, especially when trying to come off of antihistamines and the influx of histamine that it brings. I also take it for my food intolerances, which I have a lot of. Here is where I get it on Amazon, click here to check the price it’s at. This was a very effective natural supplement that has given me the power to control my allergies and food intolerances. If you have severe seasonal or food allergies, I would recommend researching how DAO could really benefit you. Quercetin is a natural flavonoid that is responsible for the beautiful silver color of some vegetables and flowers. It is heavily concentrated in onions and can be attributed to the unique feeling of freshness that you get when eating them. This completely natural and healthy supplement works by eliminating histamine from your body by stabilizing mast cells. Organic quercetin also gets rid of other allergic compounds that your produce inflammation like leukocytes. Good sources of quercetin in your diet are onions, garlic, apples, tea, broccoli, leafy greens, and berries. Eating these foods regularly may be enough to treat your allergy symptoms through the days. However, if your allergy symptoms get severe, then a concentrated quercetin supplement would definitely be great for you. 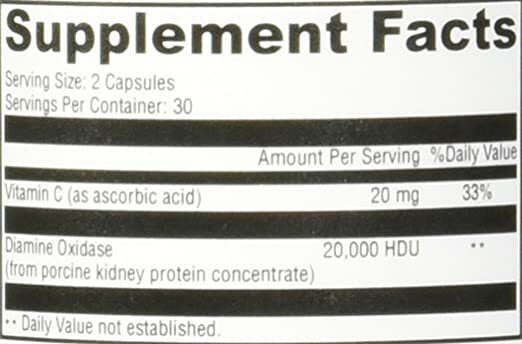 I found a great supplement here for the cheapest price I could find. I’ll update if I find a better one. In my opinion, this antihistamine is way better than some OTC drug like Zyrtec or Allegra because it is non habit-forming and much more effective. It would be a wise choice to switch to something like this that actually treats the cause of allergies, rather than masking the symptoms with more symptoms. This quercetin antihistamine is derived from vegetables and works by preventing the release of histamine. It also incorporates Bromelain, which is an enzyme that breaks down lingering amounts of histamine that remain. I know that I have to prepare for emergency allergy days, where I know that I’ll need an effective antihistamine. Herbal allergy supplements made me skeptical at first, but when I tried them, I was surprised at how effective they were in comparison to OTC antihistamine drugs. For me, herbal antihistamines like stinging nettle, quercetin, rosemary leaf and rutin didn’t give me any side effects. However, they did provide me with numerous side BENEFITS. When taking them, I experience a slight boost in motivation and focus, as well as a boost in mood and energy. I would totally recommend trying one because it is much more worth it for me than taking Zyrtec or Allegra. Help clear mucus from the lungs and nasal passages for fresher breathing. I have tried a wide range of different herbal antihistamine blends and they all worked wonderfully for the value of the product. They are much cheaper than OTC antihistamine drugs and work more effectively in my opinion. You also never have to worry about you or your child becoming addicted to this stuff. The best herbal antihistamine that I’ve tried is definitely this one. Click to see if there’s still a really cheap deal that I’ve been using for months. This is the antihistamine that I use for my allergies on the days when I need it most. Click to check out the antihistamine that I use. This supplement has been the only natural antihistamine to be more effective than an OTC drug that I have tried. And it is much cheaper than drugs like Zyrtec or Xyzal, not to mention non-toxic and non-addictive for adults and children. It works immediately for when I’m in an emergency allergy situation, but it also lasts for the long term, even longer than 24 hours. It might even last longer for you because some of the herbs in this blend absorb slowly for a long-term effect. Everyone in my family switched to this natural antihistamine and we feel much healthier every day (with more money in our pockets). Those are my most recommended methods for treating allergies naturally. It is likely that you are looking for seasonal allergy relief and all of these methods will help tremendously because they have for me. Again, it’s probably beneficial to avoid natural allergy relief supplements that use isolated vitamins and minerals. I am saying that supplements like airborne or emergen-c who claim that they boost your immune system are a scam. They are likely just a placebo if you think that they work. I know that you enjoy the bubbles and the taste, so sorry to disappoint you. Dramatic change to your health couldn’t be that easy anyway. But it’s not hard work! I am always here for you, so if you have a question or something to add about natural antihistamines that work for you, please leave me a comment below! My daughter has started developing hives for the past 14 days..She feels stuffed nosr and irritation in throat as well. She is 16yrs old. I do not want to give Allegra or anti histamine tabs. Please suggest a good anti histamine supplement which is available in India. I will surely increase natural anti histamine foods but would like to give supplement also which is absolutely safe for longer run if I give for 5-6 months to be on the safer side. Pls help and suggest. Are you unable to use Amazon for the stuff I talk about? That’s what usually works for me. Either way, I’m sure that you can find a good quercetin supplement in India. No? Found your information about Benadryl very accurate, as I recently stopped taking after years s of a nightly due to long time sinus issues. I’ve switched to generic Zyrtec…I hold e the dizziness begins to subside soon. It’s bad, and has been a week. Also- I’m a proponent of Aloe Vera juice- hoping that might help with the withdrawals. My allergy issue that I can’t deal with is my hands itch at night. Like click work around 9pm if I do not take Zyrtec or something similar. I also have nasal stuffiness but that is not nearly as irritating. Will this supplement help you think? I think that quercetin could easily replace Zyrtec as a natural antihistamine in your case. Which supplement or combo would you recommend for animal allergies? I think I have become allergic to my beloved dog. Feels like I have a stuffy nose and sore throat every evening and weekend but I’m ok when I’m out of the house. All of these natural antihistamines work well for animals as well. Especially the sulfur supplement. I would try to give your pet quercetin if their allergies are really bad. Quercetin comes from food, onions to be exact. So it should definitely be safe for them. Let me know what you think! Hi! Onions are toxic to dogs and cats. I would recommend asking a homeopathic vet what would be safe to give them. Hoping his works for me though! My allergies are really bringing me trouble. Do you need to try all of the supplements at the same time, or should you try them separately? Since these allergy supplements are natural, you can pretty much try them with whatever combination with other natural supplements with few exceptions. But stuff like the MSM can be taken as a supplement with any kind of diet because it is non-toxic like water. Together or separate works depending on what you want to try. Hi. Can these supplements be used during pregnancy safely? Any limit or precautions please provide. Thankyou so much for this article it’s very informative. I used to take Quercentin, until I became highly sensitive to the magnesium stearate added to most supplements. Unfortunately, I have not been able to find a brand of Quercentin that does not contain this ingredient. However, I have been experimenting a little to use Buffered Vitamin C to combat acute allergy symptoms. If you can tolerate magnesium stearate, then I would agree that Quercentin is the way to go. Stearic acids in its various forms (often as magnesium stearate or deviously listed as a vegetable lubricant) is a toxin, which inflames everyone’s GI tract . It is in most drugs and cheap supplements. It is illogical to consume a supplement that contains a toxin, but most of us have limited knowledge of the many toxic ingredients we ingest. Dr. Ron’s Ultra Pure is a quality company that offers Quercetin and Bromelain, but expect to pay more for a better product. There are many other companies offering quality supplements. You can’t build health with drugs and cheap supplements. I’ve used nettle freez-dried stinging hairs along with organic apple cider vinegar, this combination realy works. That’s interesting. Do you use this in a tea, or a drink with the apple cider vinegar? I’ve always wondered what natural antihistamines actually work. I tried vitamin C powder and nettle tea but that doesn’t really seem to work. I’ll have to consider trying MSM because of all the good reviews I hear. Yeah, many popular natural allergy relief methods aren’t very effective. Some natural nutrient supplements can actually heal root problems in your health. I have tried both those as well! Make sure your vitamin C powder isn’t derived from an ingredient you could be allergic to (i.e. corn). Maybe you could try a stinging nettle tincture instead of the tea. Tinctures are more concentrated, so it can be easier to tell if a certain herb will work for you or not. Cindy–be very careful with MSM if you have any sulfite-sulfate-sulfur sensitivities!! That really blew my rash and itching out of control!! Just a warning. Be well!